LTI student Yashesh Gaur earned third place in the ACM Student Research Competition at ASSETS 2015. Jeff Bigham, an associate professor in both the LTI and Human-Computer Interaction Institute (HCII), joined forces with HCII post-doc Luz Rello and the University of Maryland's Abdullah Ali to take Best Demo honors for "Dytective: Toward a Game to Detect Dyslexia." The computer-based game aims to diagnose dyslexia, and the team's early experiments have show promising results for doing just that. Conference attendees select the Best Demo winner, and the CMU team bested nearly 30 competitors for the honor, which included a cash prize. 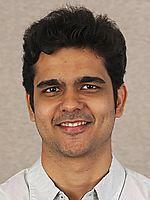 Yashesh Gaur, a student in the LTI's Master of Language Technologies program, earned third place in the ACM Student Research Competition at ASSETS for "The Effects of Automatic Speech Recognition Quality on Human Transcription Latency," which investigates how the time required by captionists to produce transcriptions from partially correct automated speech recognition output varies based on the accuracy of that output. He received a medal and cash prize for his win. Held last month in Lisbon, Portugal, the 17th International ACM SIGACCESS Conference on Computers and Accessibility (ASSETS) explored the design, evaluation, and use of computing and information technologies to benefit people with disabilities and older adults. The conference is the premier forum for presenting innovative research on mainstream and specialized assistive technologies, accessible computing and assistive applications of computer, network and information technologies.